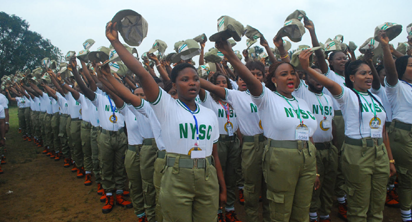 The Permanent Secretary, Kano state Servicom Directorate, Alhaji Abdullahi Musa said the organisation would synergise with the state the National Youths Service Corps (NYSC) to enhance service delivery, by the scheme, in the state. File: NYSC members Musa said this in a statement signed by the Public Relations Officer (PRO) of the Directorate, Alhaji Sunusi Abdullahi in Kano on Monday. Musa said this in a statement signed by the Public Relations Officer (PRO) of the Directorate, Alhaji Sunusi Abdullahi in Kano on Monday. The PRO quoted the Servicom boss as having said this when he (Musa) visited the State Coordinator of the National Youth Service Corps (NYSC), Alhaji Ladan Baba in Kano. 47 years of fraternal association with P.Z. Aginighan The permanent secretary, who noted the shortfall in teachers in core subjects in Government Secondary Schools in the state, stressed the need for synergy between the two organisations to address the problems. Musa, however, urged the state Coordinator to pay much attention to posting Corps members to conventional schools to teach English language and Mathematics, especially in the rural areas. Receiving the permanent secretary, the NYSC boss acknowledged that the scheme was facing some challenges in the course of its statutory responsibility to the people of the state. The state coordinator of the scheme identified non availability of NYSC lodges in most of the local government areas for Corps members and Corps members not receiving their monthly allowances, regularly, at their respective areas of primary assignment as some of the challenges. According to him, such development has discouraged the NYSC members in such areas from performing their legitimate services effectively. He, therefore, appealed to the Directorate to intervene to ensure provision of immediate solutions to the problems.